If your upper back is strong, but yet pull-ups are still a struggle for you, fixing a few simple things can make all the difference. Ahhh the bodyweight pull up. Some shudder at the thought, others jump up on a bar and start swinging around like gymnasts. What makes pull ups so difficult? And why can some people do them seemingly without effort, and others never at all? While the pull-up exercise is a great (arguably the best) indicator of overall upper body strength, there are other important factors to the lift. Your back, arms, and forearms must have impressive strength to hoist and support your entire body. So countless single-arm rows, dumbbell curls, and wrist curls later and you approach the pull-up bar…still nothing…or you wish you could do many more. 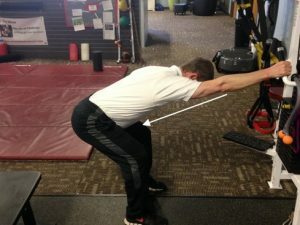 Keep reading to learn about some of the techniques we use at Precision to coach the bodyweight pull-up that will help you improve everything. Once you master this basic core exercise, you can progress to other more challenging exercises (see our YouTube page for video’s of other exercises). Grasp door frame with arm around waist/abdomen height. Allow arm to straighten – this will allow a stretch to happen in the lats. Also, beginning to foam roll your lats, chest, and back will help to increase mobility and range of motion for you as well. Many foam rolling techniques are provided on our Youtube page. 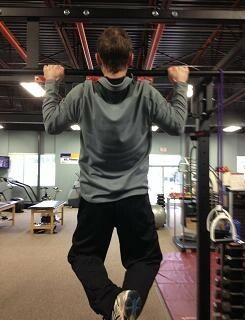 There are so many movement components that are involved in a complex lift such as the pull up. You will need a strong core, great shoulder mobility, and efficient scapulae (shoulder blade) control. Good control of your shoulder blades means you are using the correct muscles from the start. Pull-ups begin with shoulder blade movement, not arm initiation: During the video, watch the shoulder blades come together during the movement. A well-trained eye and helpful coaching cues will make your pull up goal a reality. Patience, consistency, and hard work are all you need to complete the perfect pull-up!